Haryana is the northern state of India, bordered by Punjab in the north and west, Uttar Pradesh in the east and Rajastan in the west and south and Delhi to the west. The name Haryana comes from Hari means god, ayana means home. Haryanvi is similar dialect to Hindi with a different accent is widely spoken in Haryana, followed by Punjabi. It is 21st rank by land area and the capital city is Chandigarh. There are 22 districts and 72 sub-divions in the state. As per the Aadhar Statistics the Haryana population in 2019 is 27,388,008 (27.39 Millions) as compared to last census 2011 is 25,353,081. 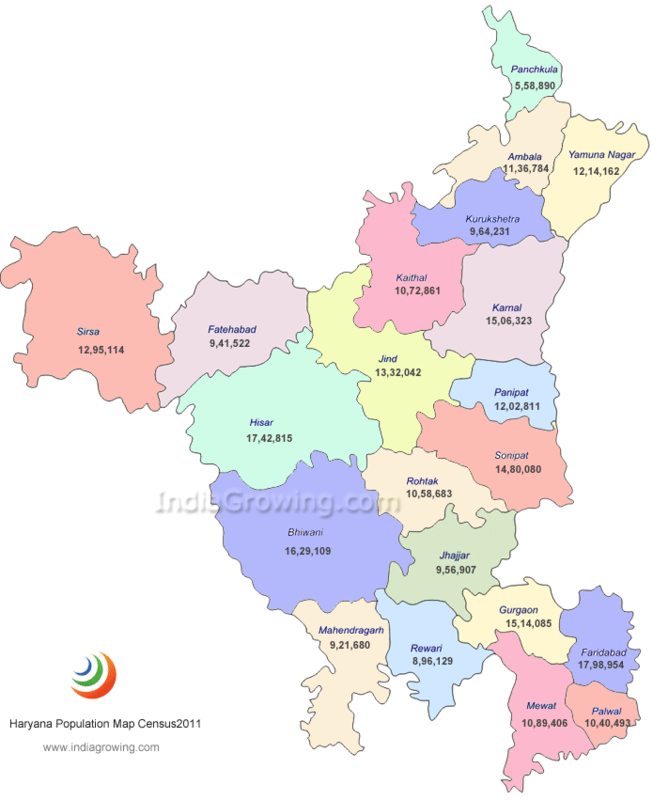 Growth rate of 8.03 percent of population increased from year 2011 in Haryana. till 2018. Chandigarh is the Capital of Haryana in india. State/Dist Population 2011 Population density per sq km.